The turn-based RPG is a staple that’s been around for a while, and nowadays it takes a revamped gameplay system to get people interested in a new one. With that said, there are tons of great recent takes on the turn-based RPG, from Persona 5 to Octopath Traveler, and even indie developers have taken notice. Zeboyd Games’ Cosmic Star Heroine is the most recent project that has headed to the Nintendo Switch, and it has a very innovative gameplay system that’s unfortunately marred by some bugs and a slightly linear story. The I, Robot sequel looks nice. Cosmic Star Heroine puts you in the role of Alyssa, a government agent who’s on the run after defecting from a corrupt leader within the group. As she and a few of her friends flee from their way of life, they uncover a conspiracy of galactic proportions as the fate of the universe rests in their hands. While something that drives that game forward, the overall plot is somewhat contrived and unremarkable across its 15-20-hour length. It won’t win any awards, but it does an adequate job of developing the main cast. 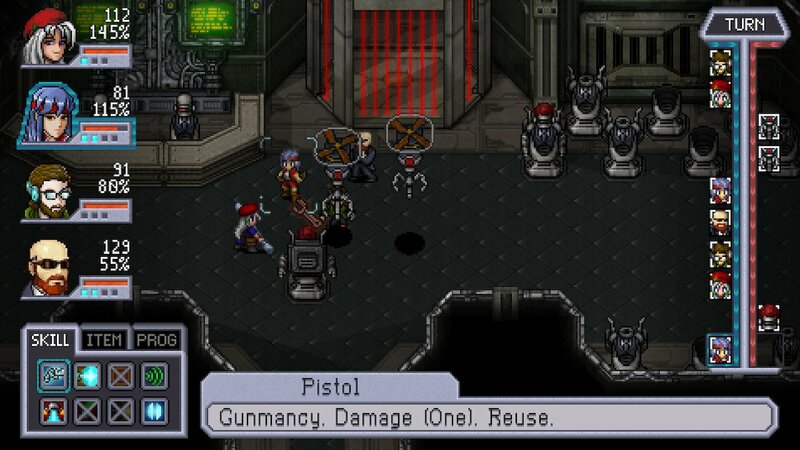 That being said, I did enjoy the playable cast of characters offered in Cosmic Star Heroine. From the main hero Alyssa to the flamboyant robot Clarke to the hot-blooded guard Finn, there’s a lot to love of the nearly dozens of characters available. Each of their personalities are also reflected in the diverse amount of abilities and attacks they can execute, and each character feels important rather than throwaway. You can tell he’s ever the optimist. While the story is underwhelming, the gameplay is stellar and addictive. Encounters are finite, as the enemy sprites roam around on the field. Engaging in one will cause a battle to start, and while there are some that are unavoidable, you can choose to not engage and run from the enemy. This means that you’ll always be at the level you need to be, and it cuts off most of the filler that comes with games like this. For those that want to keep grinding however, there’s an option to conduct a sparring battle that grants experience after you’ve cleared out an area of enemies. Battles play out in a traditional turn-based style (with character portraits signifying who will take their next turn), but that’s where the similarities to the competition end. Characters can bring up to seven different abilities in battle, ranging from attacks to buffs or debuffs or even status afflictions, with one-time use items and programs available as well. Every time a character uses an ability , it is discarded and greyed out (unless the ability is reusable). An eighth technique charges the other seven and acts as a defense technique, so it’s up to you to balance when to rest and when to dish out damage. Programs are abilities that can change based on the equipment you have, and for the most part are one-time use (though there is an ability that can conserve a program from being discarded). This limited time use system will force players to choose carefully since as the battle continues, enemies will get more dangerous. Additionally, elements are in play, and certain enemies are weak to things like wind, electric, and fire attacks. Since each character only knows specific elemental attacks, programs can grant a one-time use ability that can circumvent this limitation. The other mechanics within Cosmic Star Heroine’s system regard style and hyper mode. Most moves grant style, which is another meter that will grant damage bonuses and other things if a character accumulates enough of it. Burst abilities will consume all style but grant an even greater amount of damage. Building style is important, as having a set amount can help you survive a fatal blow and enter desperate mode, where your damage output is increased but having less than zero HP will render you unconscious for the rest of the battle. This concept alone made for a tense yet strategic addition, as I had to decide if I wanted to risk a character death in order to land a decisive attack or defend and heal. Hyper mode activates at a set amount of turns, and characters will have an increased damage output during these periods. However, enemies will get stronger on every turn, so you’ll need to prioritize finishing a battle quickly, lest you get devastated by enemy attacks later in the game. One minor thing that really stood out from other turn-based systems is the fact that debuffs and status affliction abilities are actually effective. I was shocked to see how many high level enemies and even bosses with which I could inflict poison and rust (basically a robotic form of poison), and it made characters like Lauren and Dave (who rely a lot on status techniques) viable rather than jokes. I usually hate characters that have status afflictions as their main attacks in most turn-based RPGs due to their ineffectiveness, but here? They’re amazing. Allies and enemies have an unseen status HP bar, which will cause an affliction to occur if hit with a status-afflicting attack enough times. This means that characters with these attacks can be effective, even if it seems like their attacks aren’t working initially. In addition, the game offers four different difficulty levels which change enemy behavior, damage output, spoils, and other things. You can easily switch difficulties on the fly, and this means you can cater the game to your liking. I stayed on the heroine difficulty (the second hardest one), and was provided with a sufficient challenge throughout. You can also save whenever you want, which means you can tinker with the difficulty to suit you. If you die in battle, you can also simply restart the battle from the beginning immediately or exit to the home screen, the former which is perfect if you like your current roster and just want to do things differently. Regarding the rest of the package, Cosmic Star Heroine harkens back to the 8 and 16-bit era of RPGs, from Chrono Trigger to Phantasy Star. The pixel art style is pleasing to the eye, and the backgrounds are pretty detailed. While the game is relatively short compared to something like Final Fantasy or Dragon Quest (you’ll reach the double digit hour mark, but most of the content can be completed rather quickly), it’s still a fulfilling adventure. Going back to the story however, it’s a shame that it takes a while to open up fully. You won’t be able to even swap your team until about chapter seven, and most of the game feels restrictively linear. You travel across a few planets, but most of the locations fall under the “town and dungeon” variety. In a game modeled after the RPG greats, a little more nonlinearity could have helped. As it stands, however, it’s not too bad an issue. There are some sidequests and bonus bosses of which you can partake, including one “really should be done post-game” battle against the Cthulu (which is not surprising since Zeboyd Games made Cthulu Saves the World previously). There are a few challenging quests that will appeal to veterans of the genre. Oh hey, a fourth wall break that also acts a self-plug! What’s a big annoyance, however, are the surprisingly numerous bugs within the game itself. While they ultimately aren’t dealbreaking, they’re enough for me to make notice. Some minor glitches include constantly repeating dialogue if you don’t step out of the speaking range of an NPC and even a transition where I was stuck in the next screen location and had to reset my game from the home menu. One egregious bug was when I fighting one tricky end-game boss and kept dying on one section where he summoned two powerful monsters. Restarting immediately caused one of the monsters to not disappear and stay until the boss summoned it, in which case the game would freeze and I had to restart. These are things that need to be addressed in a future update, as they’re numerous enough to be noticeable. Cosmic Star Heroine is an accessible RPG that fits very well with the Switch’s lineup. While some issues like bugs and an underwhelming story hold it back from being an RPG classic, the experience is propelled by its innovative and creative combat system and eclectic cast of characters.